Mysteries of History: “An apple a day keeps the doctor away.” ~ The History Girl! On September 26, 1774, in the small village of Leominster, Massachusetts, John Chapman was born. He was the son of the minuteman, Nathanial Chapman, who was one of many at the battle in Concord where the shot heard around the world was fired, the very beginning of the Revolutionary War. While Nathaniel continued to fight for the Continental Army, John’s younger brother died, and then three weeks later his mother, Elizabeth, passed away from tuberculosis. With all this going on in the young man’s life, his older sister, Elizabeth, began to take care of him. There is not too much written about young John, but there is note that when his father remarried, the entire family moved to Longmeadow, Massachusetts. However, in 1797, John Chapman, the practical nurseryman and entrepreneur started to make his trek southwest. John had a vision that someday people would move west. Therefore, he stayed one-step ahead of the pioneers. Along the way, he stopped in Pennsylvania at a few cider mills and bought as many seeds as he could carry. 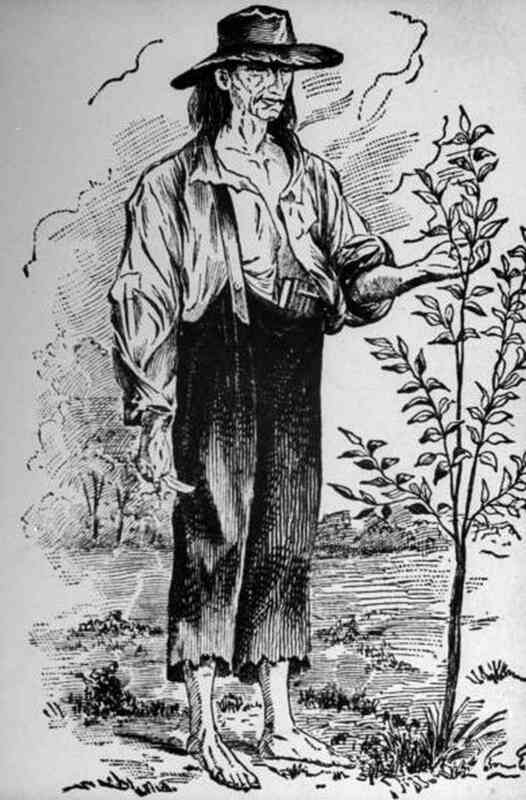 Starting in the Ohio Territory, he began to plant the first of many apple trees. To make sure that the pioneers would be able to survive the first few years in the new territory, law required that the settlers must plant fifty apple trees. Because of poor transportation during those years, apples became a staple to the pioneer’s diet. John purchased tracts of land all over the Ohio and Indiana territories, for the use of growing apple orchards and to transplant seedlings. Along with planting and growing thousands of fruit trees, he planted in the minds of the settlers, The Word of God, becoming a self-appointed missionary for the Church of the New Jerusalem, a Christian church based on Biblical interpretations from Emanuel Swedenborg. With the understanding of the Bible, John became the perfect peacemaker between the Native American Indians and the pioneers. For more than fifty years, John traveled the Midwest spreading his knowledge to anyone who would listen. Then on March 18, 1845, the man who will always be known to the world as Johnny Apple Seed, passed away at his home in Fort Wayne, Indiana. Next time you hold a shiny red apple in your hand, think of the man who all those years ago showed the pioneers that anything is possible with a little bit of faith.